Correction: It was incorrectly stated that typically a booster is secured by recovery crews following a touchdown. In fact, SpaceX use a small robot referred to as the Octograbber to secure the booster. However, the robot is not yet compatible with the Falcon Heavy central core. As a result, crews are required to board the droneship and weld the booster’s feet to the ship’s deck. Due to the severe weather conditions in this instance, crews could not make it aboard the droneship to complete this procedure. 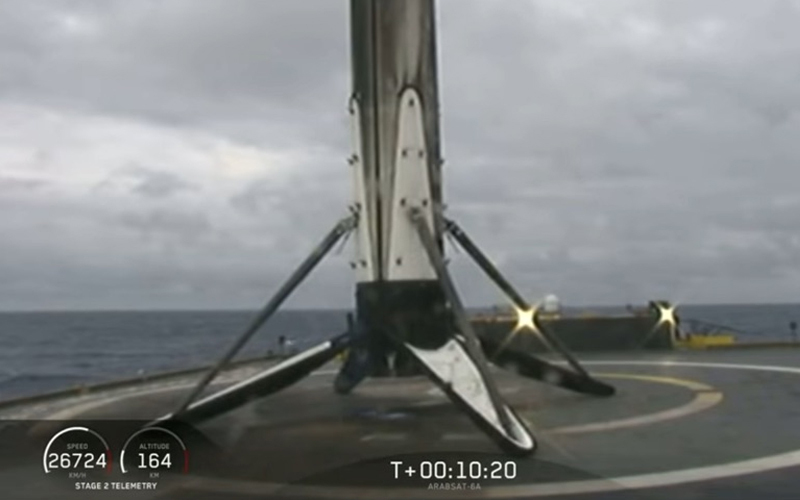 SpaceX has confirmed that the central core of the Falcon Heavy that touched down on a droneship in the Atlantic Ocean has toppled over in rough seas. The Calfornia-based launch provider has stressed that the loss will not affect upcoming missions. The Falcon Heavy lifted off from the Kennedy Space Center carrying the Arabsat-6A communications satellite on Thursday, April 11. Following a successful launch, both side boosters and the central core were recovered. Typically after a booster touches down, recovery crews arrive to secure it to the deck of the droneship to enable the pair to be brought back to port safely. However, in this instance, heavy seas prevented crews from securing the booster. As swells worsened, the booster could no longer remain upright and toppled over. It is yet unclear what damage the core suffered or if any recovery was possible following the mishap. The side boosters and central core used for the Arabsat-6A mission had been earmarked for reuse to launch the next Falcon Heavy mission. However, due to the loss, a new central core will be used for the launch currently scheduled for NET June 19.